Monáe’s ‘The ArchAndroid’ was one of the best albums of 2010, so it’s been a long wait for fans as new material has been promised on numerous occasions (Fun.’s We Are Young hardly counts). Now the moment has arrived, with this new track in collaboration with Erykah Badu released as the lead single from forthcoming album ‘The Electric Lady’. Q.U.E.E.N is a confusing track at first, with its unpredictable shifts and kaleidoscope of musical genres. Prince-esque funk guitars strum against a hip-hop beat, synth and voice fragments lend a 90s RnB feel, before the whole thing collapses in a soulful wash of sultry strings, jazz trumpets, conga rhythms and rapping. The track certainly has an air of experimentation, more studio jam than true single. As Monáe sings, “categorize me, I defy every label”. That lyric has a whole other meaning though. Monáe’s accompanying tweet was particularly telling as to the song’s sentiment. 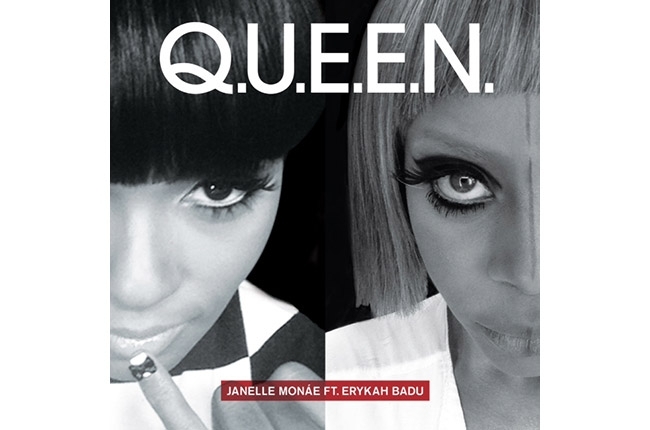 “Q.U.E.E.N was inspired by private discussions between Erykah and me. It is meant to make you JAM. DANCE. FUNK OUT. and dialogue later…”. What exactly were those private discussions about? Some have suggested it concerns Monáe’s sexuality, specifically the third verse “Hey sister am I good enough for your heaven?/ Say will your God accept me in my black and white?/ Will he approve the way I’m made/ Or should I reprogram the programming?”, before claiming “Even if it makes other uncomfortable, I wanna love who I am”. At the least, we can be sure that ‘The Electric Lady’ will be a more personal album than ‘The ArchAndroid’ – there’s no alter-egos here, just Monáe’s personal desires laid out in truth. The most important lyric of all, though, comes at the end: “The booty don’t lie”. The funky rhythms are utterly infectious, resulting in a dance track that is guaranteed to have you jamming, dancing and funking out. Listen: Q.U.E.E.N is available now.